Breakfast is my favorite meal of the day and I’m always on the lookout for something different and I hit the jackpot with this recipe for a Paleo Pizza Frittata over at Against All Grain blog. 2 – Whisk together eggs, almond milk, oregano and salt in a bowl. 3 – Melt coconut oil in 8” non-stick skillet and add two sausage patties. 4 – Once patties are cooked, dice them up in the skillet with a spatula and remove meat but leave grease in the skillet. 5 – Add onions and romaine lettuce to skillet and sauté for about 5 minutes and then remove from heat. 6 – Add sausage and pour egg mixture into the skillet. 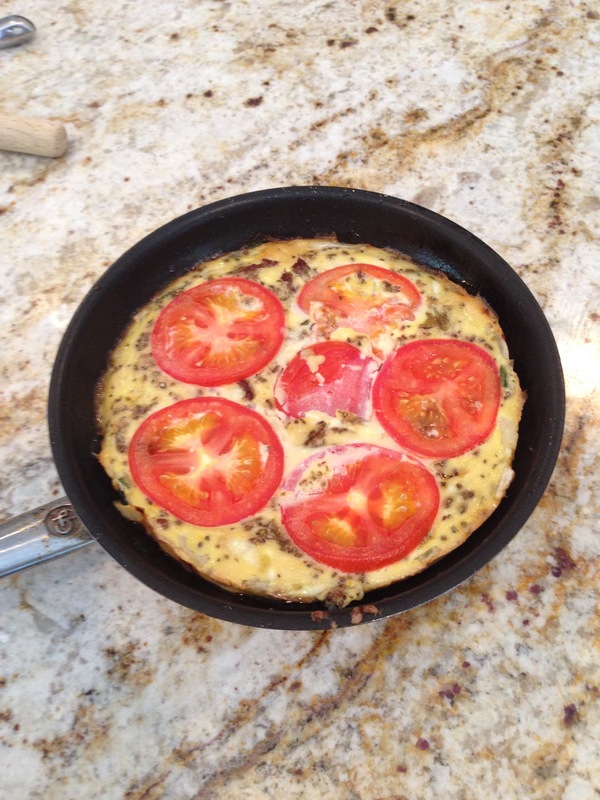 7 – Add slices of tomato to the top and place in the oven for about 20 minutes or until eggs are cooked through. Notice I didn’t drain off the grease (fat!) from the sausage and the coconut oil. That goodness gets soaked up by the onions, romaine and egg mixture and is good for you! Although I don’t often use the oven during the summer months, I’ll make this in the fall!